A view of the streets of Mountain Lake Park, Garrett County, Maryland. 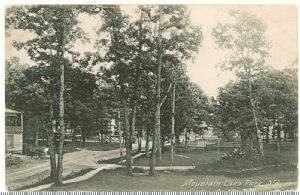 The Mountain Lake Park Association welcomed many visitors, some of whom decided to purchase land and build cottages while others stayed at the boarding houses and hotels that were built. Christian principles were promoted and covenants were established for those living and visiting here which prohibited gambling, card playing, dancing, and the use or sale of alcohol. Mountain Lake Park (Md. ); Garrett County (Md. ), Pictorial works.